Find clarity and take ownership of YOUR future! 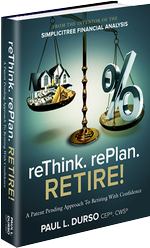 reThink, rePlan and RETIRE with Confidence! Sick of the same old advice? Stop following the herd and Start thinking for yourself. Begin today, it only takes 2 minutes! Fee based financial planning and investment advisory services are offered through Insight Folios Inc, a Registered Investment Advisor. Insurance products and services are offered through Durso Capital Management Co. Insight Folios Inc and Durso Capital Management Co are affiliated companies and do not offer legal or tax advice.